Jeppesen was recently granted FAA approval for its Airport Moving Map application for Class 2 EFB devices, and is the first and only company to have received approval. Jeppesen was recently granted FAA approval for its Airport Moving Map application for Class 2 EFB devices, and is the first and only company to have received approval. Jeppesen Airport Moving Map uses a detailed database to dynamically render maps of the airport surface, and through the use of GPS technology, show pilots their position (“own-ship”) on the airport surface. The result is much improved positional awareness among flight crews, which is a critical safety factor for reducing runway incursions during ground operations at busy commercial airports with complex runway and taxiway layouts. Jeppesen has conducted numerous field studies using simulators and airline flight crews to validate the benefit of Airport Moving Map technology for EFBs. These studies revealed consistent improvement in pilot performance because flight crews are better able to anticipate their location in relationship to runways, taxiways and parking locations. Additional research by the Commercial Aviation Safety Team (CAST) estimates that runway incursions caused by pilot deviations can be reduced by 50 percent when flight crews have Airport Moving Map. “This TSO approval for our Class 2 EFB Airport Moving Map is a very important milestone for Jeppesen, the FAA and the aviation industry,” said Rick Ellerbrock, Jeppesen enterprise solutions strategist. “We have a passionate belief that Airport Moving Map is a critical element in improving aviation safety and reducing runway incursions. Our research proved this and now the door is open for airlines to begin wide-spread adoption of Airport Moving Map on both Class 2 and 3 EFBs. 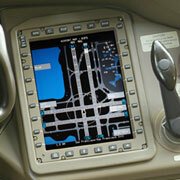 The Jeppesen Airport Moving Map application has been in use on Class 3 EFBs for almost five years now. Approval of the Class 2 application is significant because it makes enhanced situational awareness available to a much larger group of aircraft. Airlines are looking at Class 2 EFB hardware solutions to cost effectively retrofit large fleets of existing aircraft, which, when coupled with Jeppesen Airport Moving Map, is a major step forward in reducing the risk of runway incursions. The FAA finalized new policies at the end of April 2007, embodied in Advisory Circular AC 20-159, to allow Airport Moving Map with own ship position to be shown on Class 2 EFBs. Jeppesen worked closely with industry groups and the FAA on the new policies. Jeppesen Airport Moving Map has been a featured application on Boeing's highly successful Class 3 EFB since its introduction five years ago. Boeing has delivered Class 3 EFB to 48 customers for 345 aircraft. With the new TSO approval for Class 2 EFBs, Jeppesen is able to extend the reach of this important safety enabler to include many of the retrofit fleets. Jeppesen is currently working with a number of major North American carriers to begin deployments on Class 2 EFB. In March Jeppesen plans to deliver the TSO-approved software to begin integration on the Continental Airlines EFB system provided by NavAero. This begins a first-time integration effort lasting approximately two months, leading to a May or June target date for first in-service use of Airport Moving Map on a Class 2 EFB. The approval was granted under what is known as an FAA Technical Standard Orders (TSO). A TSO is a minimum performance standard for specified materials, parts, and appliances used on civil aircraft. Receiving a TSO authorization is both design and production approval. Airlines must still undergo a six-month evaluation period to use EFBs in their operation, but there is no further approval required for Jeppesen Airport Moving Map. Jeppesen has approximately 200 of the world’s commercial airports in its database for Airport Moving Map. High-resolution pictures and video of Jeppesen Airport Moving Map are available online (look under the "more information" tab at the bottom of the page).